When is the Proper Time to Have Trees Trimmed? Unruly trees could look about as bad as a guy who hasn’t trimmed his beard in years. While some people might be into this, the general consensus is that it’s both unhealthy and unsightly. Much like beards, trees need to be trimmed and pruned regularly so that they could maintain their health and look lovely in your yard. A tree that’s left to grow can be more susceptible to breakage, which can be dangerous if you have people walking underneath them regularly. By scheduling regular trimming, or pruning, by your local tree service company, you’re doing both your home and garden a favor. Today, we’re going to talk about the ideal times to trim your tree! Trimming your tree at the correct time of year is important. There are specific tree pruning times so as to prevent tree disease and slow healing of wounds. Additionally, if you prune your tree during a time when sap is beginning to form, the excess caused by pruning could look messy and attract pests. Late winter is the ideal time to schedule tree service for conifers, trees that don’t bloom, and trees that bloom in the summer. Halo Tree Service recommends trimming trees in late winter for a few reasons. First, because it is winter, deciduous trees aren’t going to be covered in leaves, which often obstruct vision. Second, the diseases that often attack trees aren’t going to be as abundant during the winter, making it a safer time to cut branches and twigs, which can make trees more susceptible to disease. And third, late winter is the time when the coldest parts of the winter have likely passed. Therefore, once spring blooms in a few weeks, your tree will be fresh and ready to grow and blossom. While we recommend having your trees pruned in late winter, we hold an exception for trees that bloom in the spring. Right after your spring trees bloom, it’s okay to trim them and get rid of weak and dead branches. Therefore, post blooming, they’ll be ready to flourish and sprout new, strong, and healthy branches! There are a lot of tree diseases that are prevalent in the summer, so we hesitate to prune trees substantially during this season. However, because of summer storms that can often damage trees, we do give the okay on removing dead branches as a safety precaution. If you notice that a tree is damaged and needs branches trimmed off, don’t hesitate to call Halo Tree Service here in Shelby County. 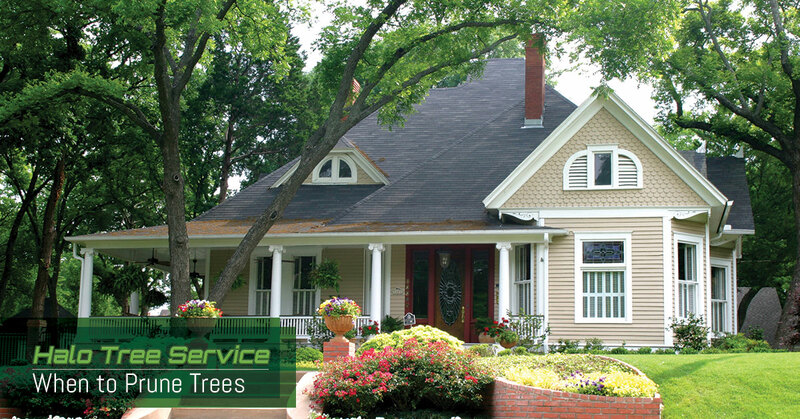 We have the tools and expertise to trim the trees efficiently. Fall is likely the worst season to trim trees. During this time, trees are beginning to make their summer to winter transition, shedding their leaves in the process. Trees are inherently less active in autumn, and wound healing is significantly slower. To make matters worse, spores from damaging fungi are most abundant during the fall. Wounded trees mixed with fungi isn’t a pretty picture. Hopefully, you learned a little something about tree trimming today. For help with pruning, stump removal, or anything related, please call Halo Tree Service, today!